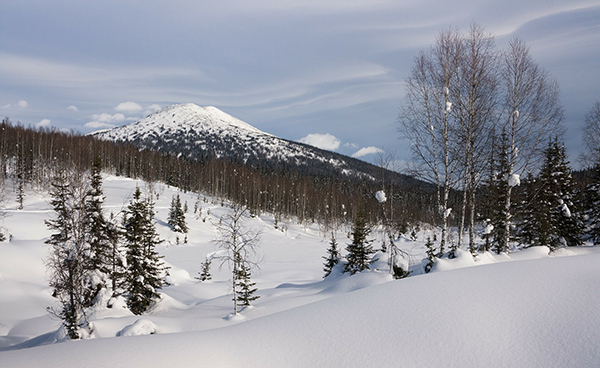 Depressions are a typical feature in Arctic environments, such as in Siberia. 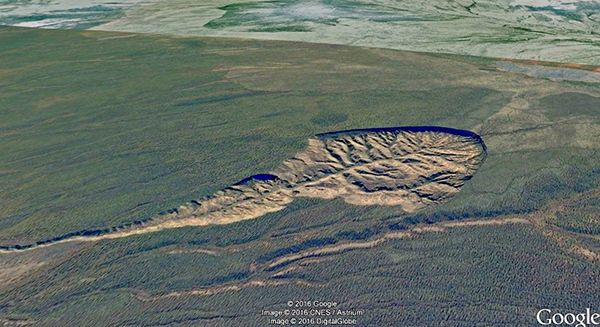 The Kuznetskiy Alatau Mountain Range is located between two of them, the Kuznetsk and the Minusinsk. On the tundra of Siberia, near the coldest city on Earth, there’s a place that local people have come to call a “gateway to the underworld” or a portal to hell. It’s a huge crater, and it has been growing for years. Currently, it measures a mile long and nearly 400 feet deep. It’s called the Batagaika Crater, and it first made its appearance in the 1990s. And while holes due to thawing are a typical feature in Arctic environments such as Siberia, some scientists see the Batagaika “megaslump” as an anomaly—and a sign of far worse things to come for you, me and the rest of the world. The appearance of the Batagaika Crater started sometime in the 1980s or early 1990s after an industrial facility clear-cut a parcel of forest. No longer shaded by trees in the warmer summer months, the ground slowly warmed under the direct sunlight. And because trees transpire water through their leaves, they increase surface area contributing to evaporation. When a molecule of water evaporates, it takes with it some heat that could otherwise be used to warm the nearby environment. This cold “sweat” from the trees as they transpire also helps keep ground cool. As this patch of Siberian ground surface warmed up, then, the soil layer on top of the permafrost began to warm. That heat caused the permafrost itself to thaw. Once this process started and the ice was exposed to warmer temperatures, the melting escalated. And now the gash caused by the Soviet industrial plant is being enlarged and shaped by climate change. As global warming due to climate change has continued to grow worse, unprecedented heart waves have rippled across this area of the Siberian tundra. So, the Batagaika Crater, born of deforestation, is now being exacerbated by a warming climate. 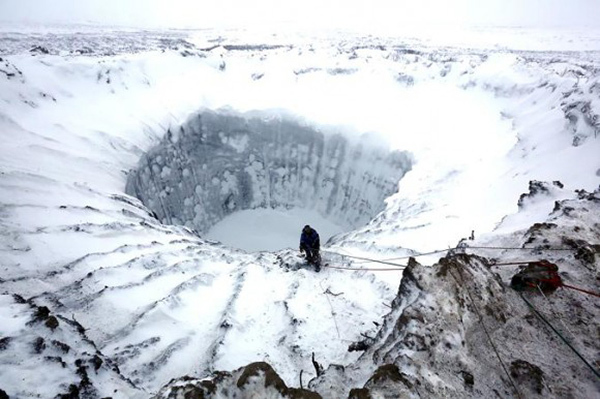 From geologic records, scientists know that the last time Siberia saw a geologic slumping on the order of this magnitude was 10,000 years ago, when Earth transitioned from the Paleolithic Ice Age into the current-day Holocene (or Anthropocene). Today, greenhouse gas emissions have climbed to 400 parts per million, far surpassing the CO2 levels of 280 parts per million that brought about the end of the last glacial maximum. And that should greatly concern us. A ticking time bomb to an environmental apocalypse? Melting of the Arctic’s permafrost should be one of our greatest fears because not only would it release carbon dioxide but vast amounts of methane, a greenhouse gas much more potent than CO2. The most serious threat to the Arctic tundra is global warming. 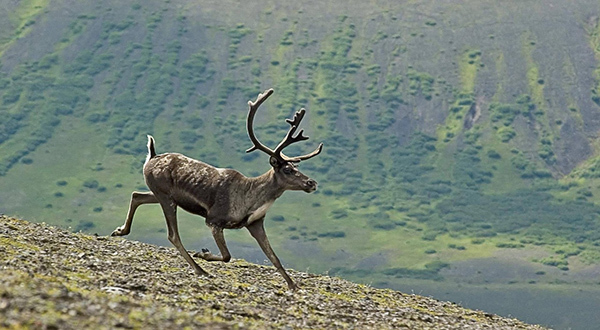 In recent years, caribou herds across the Arctic have shrunk by hundreds of thousands. Permafrost contains a lot of organic matter, including carbon loads that have been locked away for thousands of years. Global estimations of the carbon stored in permafrost equal the amount that’s currently in our atmosphere. So, if all the world’s permafrost melted—a process that would start on an epic scale after about just four more degrees of warming—it could double the amount of heat-trapping carbon dioxide already enveloping the Earth. As more and more permafrost thaws, more and more carbon is exposed to microbes. The microbes consume the carbon, not only producing carbon dioxide as a waste product but methane, as well. Both of these greenhouse gases are then released into the atmosphere, accelerating warming further in a positive feedback loop where warming accelerates warming. According to the U.S. Environmental Protection Agency, pound for pound, the impact of methane on climate change is more than 25 times greater than CO2 over a 100-year period. An increase in methane emissions would have a disastrous effect on the planet’s already-troubled atmosphere, tipping us into a world full of climate horrors. 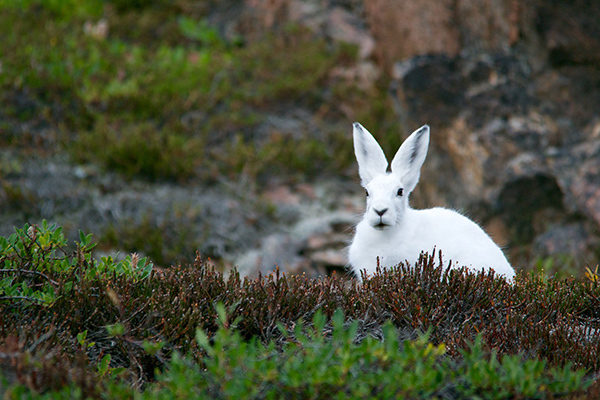 Some studies show that large swaths of the Arctic tundra, home to Arctic hares, will be warm enough to support lush vegetation and trees by 2050. Or maybe the locals are right. It’s a gateway to hell. And it’s one that we’ve created.